Oral argument in two Supreme Court cases of particular interest occurs this week. On Monday 2 March 2015, the Court heard argument in Arizona State Legislature v. Arizona Independent Redistricting Committee, addressing how states draw Congressional voting districts. 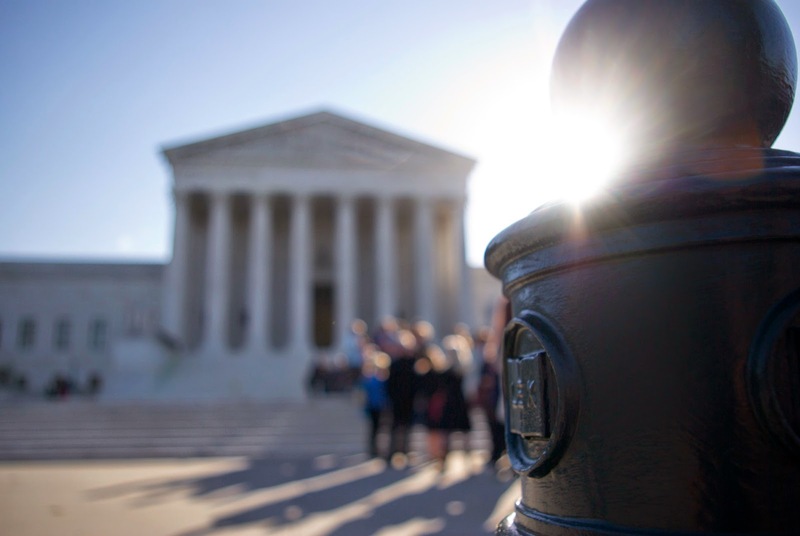 On Wednesday 4 March 2015, the Court will hear argument in King v. Burwell, addressing the Affordable Care Act (ACA) and tax credits for health care purchased through federal health plan exchanges. Brief case summaries and resources to consider follow the jump. Both cases ask a seemingly basic question about the meaning of a word. The Arizona case asks: What does "legislature" mean? The health care case, the second challenge to the ACA the Supreme Court has heard, asks: What does "state" mean? The implications of these seemingly basic questions are enormous. The Arizona case, in defining what "legislature" means, will define what body of government may regulate elections and by extension whether the people of a state have the power, through referendum, to control what the state legislature (House and Senate in Arizona) may do. The health care case, in defining the word "state," will define the power of the federal government to subsidize health care premiums in 37 states that have not set up their own health care exchanges or where the federal government helps to run a state exchange. At risk, if the Court decides that "state" means only state government and not the federal government: access to tax credits for health care premiums, an important means ACA sets up to make health care coverage affordable. Transcripts of oral argument appear on the Supreme Court's Web site on the day the Court hears argument in the case. Audio recordings appear on the Court's Web site at the end of the week in which the Court heard argument. SCOTUSblog offers a summary of the case and links to case filings and SCOTUSblog's coverage. The Court should decide these cases by June 2015. The Court considers whether Arizona's redistricting process violates the Elections Clause of the United States Constitution. In 2000, Arizonans passed Proposition 106, a referendum that amended Arizona's Constitution to empower the Arizona Independent Redistricting Commission (AIRC) to control Congressional and state electoral districting instead of the Arizona legislature (House and Senate). AIRC has five members (two Republicans, two Democrats and one Independent), four of whom are appointed by leadership in the Arizona legislature, the fifth of whom the first four members choose. Ms Totenberg's coverage cites Paul Clement, who represents the Arizona state legislature: "We make the radical claim that when the Framers used the word 'legislature' they meant the word 'legislature. '"; and Ted Olson, who filed an Brief Amici Curiae on behalf of former Republican Governors of California: "We looked back at the definition of 'legislature' at the time the Constitution was written and it didn't mean a particular body, it meant the entity or collection of individuals that made the law." The Court considers whether the an Internal Revenue Service tax credit for health plan premiums applies to coverage purchased through federal rather than state health care exchanges. A useful set of graphics illustrating the potential impact of a decision in King v. Burwell restricting the meaning of the word "state" to exclude the federal government. According to The New York Times, 8.7 million people benefit from the tax credit at issue in King v. Burwell. Mr Liptak profiles Thomas Christina, a South Carolina employment benefits lawyer who found a new theory on which to challenge the Affordable Care Act.